Item Number : 00854Feature : DINING TABLEDimensions : 39W x .. Item Number : 04075Feature : CHATEAU DE VILLE DINING TABLEDimensi.. Item Number : 07045Feature : REC.DIN TABLE W/MARBLE 38Wx64LDimens.. Item Number : 07059Feature : 54x54 BK MARB COUNTER H. TABLEDimens.. Item Number : 07250Feature : BRAVO COUNTER HEIGHT TABLEDimensions.. Item Number : 07380Feature : COUNTER HT TABLE 54"X54"X36"HDimensi.. Item Number : 08185 KITFeature : MARTINI DINING TABLEDimensions :..
Model Number: 100186Dimensions:Width: 35 x Depth: 35 x &n..
Model Number: 100491Dimensions:Width: 29.5 x Depth: 47.25 ..
Model Number: 100520Dimensions:Width: 35.5 x Depth: 35.5 ..
Model Number: 100770Dimensions:Width: 42 x Depth: 42 x &n..
Model Number: 100771Dimensions:Width: 30.5 x Depth: 59 x ..
Model Number: 101811Dimensions:Width: 32 x Depth: 35 x &n..
Wood Finish LATTEWood Finish 2 VINTAGE WHITEDescription	&..
Wood Finish LATTEWood Finish 2 VINTAGE WHITEDescription &n.. Finish Color CHROMEDescription	HeightDINING TABLE	29.50.. 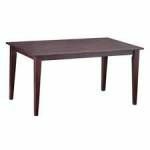 Finish Color WALNUTDescription	Width	DepthDINING TABLE	35.50	30.00Box Size ..
Metal FinishZINCMetal Finish 2MATTE BLACKDescription	&nbs..
Model Number: 107723Dimensions:Width: 23.5 x Depth: 24.5 ..
Wood Finish BURN AMBERWood Finish 2 RUBBED CHARCOALDescription &.. Finish Color CHROMEDescription Width	DepthDINING TA..
Wood Finish NATURAL WALNUTDescription	&..
Wood Finish ISLAND KHAKIDescription	&nb..
Wood Finish VARIED COFFEEDescription	&..
Wood Finish VARIED NATURALDescription	&..
Wood FinishKHAKIWood Finish 2BLACKDescription	..
Metal FinishANTIQUE SILVERDescription Height	Diamet..
Wood FinishNATURAL MANGOMetal FinishMATTE BLACKDescription	&nbs.. Finish ColorBLACKMetal FinishBRUSHED NICKELDescription	&n..
Wood FinishBURNISHED BLACKDescription HeightROUND T.. Item Number : 12150Feature : KIT- DOUBLE PED. DINING TABLEDimensi..
Model Number: 122211Dimensions:Width: 44 x Depth: 104.75 ..
Wood Finish RICH BROWNWood Finish 2 WHITEDescription	&n..
Wood FinishPALE ALEWood Finish 2WHITEDescription	&n.. Product DetailsAlpine Furniture 1437-01 Granada Extension Dining Table Coco.. Product DetailsAlpine Furniture 1437-03 Granada Pub Table Coconut Shell Mos..